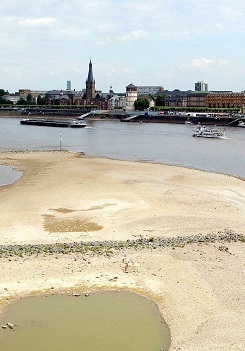 LONDON (ICIS)--Chronic low water levels along key European chemicals shipping artery the River Rhine are having a significant impact on the amount of product that can be transported, according to sources on Monday. German chemical major BASF said on Monday it had been forced to reduce production at its Ludwigshafen, Germany, site. Limited rainfall and heatwave temperatures have caused water levels to fall below 100cm along long stretches of the thoroughfare, with market sources reporting that barges are loading at 50% capacity or below. Other market participants have reported ships carrying chemicals running aground in recent days, and transportation costs soaring as a result of the limited freight capacities. Transportation is said to be particularly problematic to the north or south of Germany due to acute bottlenecks in the centre of the country. Low water levels are also having an impact on production facilities nearby, with federal authorities in Germany limiting the amount of water that can be withdrawn from the river. BASF has adjusted production at its Ludwigshafen verbund headquarters due to restrictions in the amount of water it can take from the river for cooling purposes. The logistical difficulties presented by the drought have also led the company to examine other methods of transporting deliveries from Ludwigshafen. “In view of the weather and water level forecasts, BASF is preparing to shift to alternative modes of transport in consultation with its customers,” the company said in a statement. “In individual cases, delivery bottlenecks may occur if the current weather situation persists,” it added.